Does Soulja Boy use Pretty Boy Swag in Music Marketing? Soulja Boy used the internet to launch a very successful hit single “Crank Dat” including an instructional viral video. Once again Soulja Boy is breaking music marketing barriers with his latest promotion. 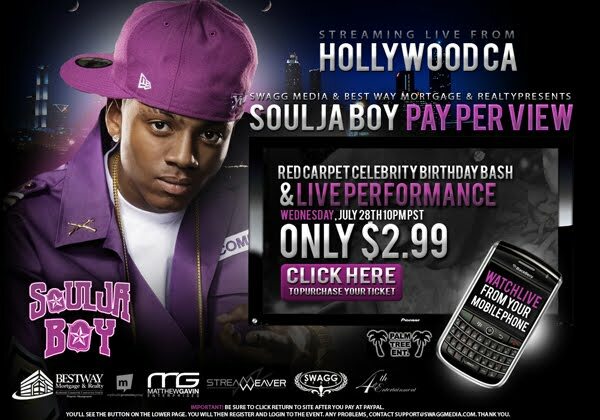 Joining forces with Swaggmedia.com, Soulja Boy is celebrating his birthday and streaming it live over fans cell phones, proving once again…it’s all about getting in the fan's pocket. Craig Nobles, Swaggmedia.com’s founder commented, “The future of music is a combination of technology teamed up with the artist to provide immediate and continuous content. Swaggmedia.com provides just that, an opportunity to reach millions of viewers with their music, products and interviews from the comfort of their home or the convenience of their cell phone.” (BlackWeb 2.0) It’s brilliant! It gives fans just what they want. This pay-per-view event will include live stream of The Party, Celebrity Red Carpet and live performances all viewable on your cell phone for $2.99. Knowing he has over 2 million twitter followers alone, he’s stands to make a good amount of cash. How do you tap into your Pretty Boy Swag? Think about recent inventions that have revolutionized the music business like YouTube.com, ipods, and cellphones. Along with them came internet based music stars and millions of promotional and music marketing opportunities. Pay attention to what the younger tech savvy generation is doing and find a creative way to make money with it. Are you considering hiring a Music Manager to handle your music business affairs? This is a very big step in an artists career. A decision that could make or break you. Here are 5 important questions to ask before you put your career in the hands of someone else. 1. Do you have a lawyer? Contracts are complicated. You’ll have peace of mind and protection if you have an attorney available to look over your music business contracts before signing them. There are options available for affordable attorneys. 2. Is the person you are considering willing to sign a contract? It’s best to make sure everything is in writing. Remember that friends don’t always stay friends when money is involved. It’s best to protect everyone up front. 3. Are you positive this person has your best interests in mind? This should include your vision of where you want your musical career to go. 4. What do you expect out of a Music Manager? Make sure to be specific and long term on this. If your long term goal is get your music in the movies, does the person you are considering know how to get those connections? 5. What is the Music Managers role in your online strategy? There’s a viral video going around where Justin Bieber’s Manager, Scott "Scooter" Braun, says that he reminds Justin to tweet several times a day. The young Manager of this teen sensation also said the fans know when the Record Label is tweeting or updating the status for the artist. So try to implement the manager’s role in promoting you in creative ways on the web. It's obvious that Justin Bieber's manager knows what he's doing. Make sure you have clear expectations before you hire a Music Manager to handle your Music Biz career.